UNESCO’s first City of Gastronomy in the U.S. relies on its built-in biodiversity and a wide network of food justice organizations to feed its most marginalized residents. Tucson is a foodie town. But rather than artisan breads and local avocados drawing crowds of tourists, it’s the relationship between diverse plants and people that earned it the distinction of being the first UNESCO City of Gastronomy in the United States in 2015. The UNESCO distinction came as a result of Tucson’s long agricultural history and its wide-ranging efforts to preserve its food heritage and increase access to healthy, culturally appropriate foods for all residents. And a recent report from the University of Arizona Center for Regional Food Studies, on the “State of Tucson’s Food System,” delved further into how the city can use its UNESCO designation to further improve its food system. Poverty is rampant in Tucson. By various estimates, between 20 and 25 percent of the population cannot afford to pay for basic needs. But while many people live in so-called “food deserts,” the term may be a misnomer in the arid but fertile city where flourishing plant life defies global trends from habitat destruction to biodiversity. Because of protective farming traditions that span the last 4,000 years, more than 2,000 edible plant varieties thrive in Tucson—from prickly pears to mesquite pods and Pima Lima beans. “Where[as] most of North America lost two-thirds of pre-Columbian crop varieties, the Southwest has retained most of those,” Nabhan said. The ancestral foods that still thrive today, offered Nabhan, have survived much in part because of Native farmers like the Pascua Yaqui and the Tohono O’odham. Now a host of community gardens, organizations like seed saving cooperatives, and institutions including the regional food bank are working in their own ways to nurture the region’s rich agricultural traditions. “It’s complementary stuff. 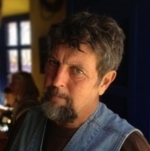 It’s not like we all get together ad hoc, but they’re bright people,” Nabhan said of the those whose efforts are at once conserving the native ecosystem while also stemming food insecurity. The correlation between the encroachment of western diets and prevalence of food-related disease among indigenous people, like members of the Tohono O’odham Nation, is glaring—and drives many of the city’s food justice efforts. “In 1960, no Tohono O’odham had ever been diagnosed with adult-onset Type-2 diabetes, and now an estimated 60 percent of adults over 35 and kids as young as 5 and 6 years old have the disease,” said Tristan Reader, a researcher of Native American food sovereignty issues who spent 20 years on a Tohono O’odham reservation. “Those are the highest rates in the world, and that’s almost entirely a result of the shift from the traditional diet to a more mainstream American diet,” Reader said. The mission to rebuild Native foodways drives agricultural organizations like the San Xavier Co-op Farm, where sacred Tohono O’odham practices nurture traditional crops, and the Native Seeds/SEARCH seed bank, through which Native American gardeners can access discounted indigenous seeds. But in spite of the progress made by these and other grassroots organizations, Native voices still go unheard by the state policy makers who determine farming practices and, by extension, food policy. The Arizona Depart of Agriculture governing board has yet to include a Native American, Hispanic, African, or Asian member. Without representation, advocates say that those whose diets are most likely to be compromised by systemic inequality will continue to go without the fresh desert food once enjoyed in abundance. For thousands of years, the oft-dry banks of the Santa Cruz River have provided fertile ground for growers like those at the Las Milpitas Community Farm. 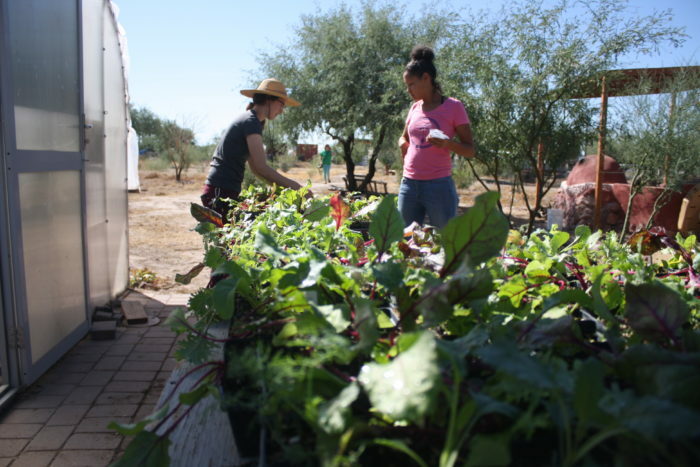 An extension of the local food bank, the six-acre farm is nestled between the river and two trailer parks in a low-income neighborhood on the western edge of Tucson. 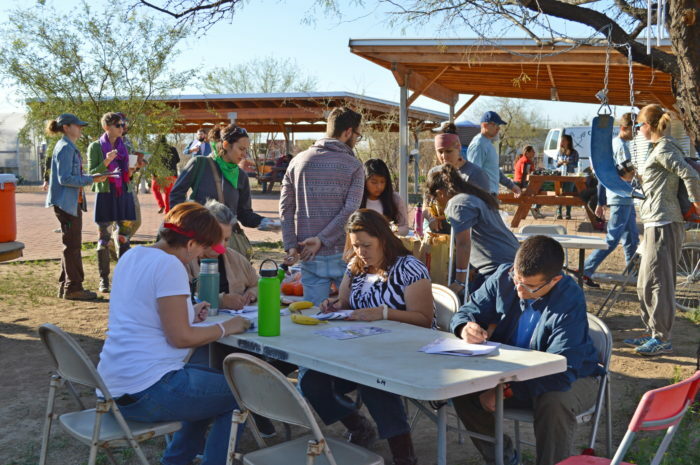 It is one of at least five community farms scattered across Tucson and an important source for otherwise out of reach organically grown, native food like tepary beans and yellow watermelons. But Las Milpitas isn’t just a place for harvest; it’s also a space for change. While vegetables sprout among pollinator plants and mesquite trees, gardeners convene for sustainability workshops or potlucks. 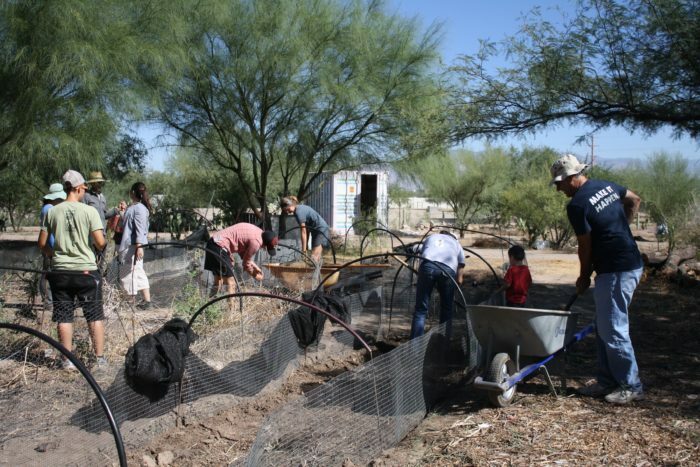 “We’re offering this to the Tucson communities for free to build skills around food cultivation and food growing … and to give them a sense of confidence and self-sufficiency,” said community coordinator Elena Ortiz. A group of Tucson librarians have also developed a system of distributing seeds—using the extensive reach of the public library—as a means to improve the health outcomes of residents who struggle with food access. In 2012, the Pima County public library system began distributing heritage seed packets—once a luxury good for hobby gardeners—to anyone with a library card. “The desire of our community members to reconnect with their food and its source was palpable,” founding librarian Justine Hernandez and her colleague Sharon Holzman-Cox explained in an email to Civil Eats. According to the state-of-food report, those without financial means benefit from diets rich in diverse plants. “Hunger and food insecurity are often exacerbated in communities where diets are chronically monotonous because many nutrient-dense foods are priced beyond their citizens’ reach,” the report reads. Not that giving people access to more plants is a cure-all. Seed packet circulation in county nearly quadrupled in the five years since librarians began offering the seeds. Now, the Pima County seed library is one of the largest in the world, serving more than one million residents through an inter-library seed loan system operating across all 26 branches. Making space for local, affordable, and culturally appropriate food is not an easy undertaking, even in an UNESCO City of Gastronomy. Those working to reframe Tucson’s food system are doing so on their own terms and with varying degrees of support. Most grassroots groups go without the kinds of resources that are available to larger institutions like the food bank or the public library. Without space for more community gardens or capital for projects like restaurants that offer meals prepared with traditional food, advocates are waging an uphill battle. But the community remains as resilient as the plants that blossom on the banks of the Santa Cruz River. “It reminds me that innovation always begins on the margins [and] the necessity-is-the-mother-of-invention thing is absolutely true here,” said Nabhan. Photos courtesy of Las Milpitas Community Farm.